One day Adi Guru Shankaracharya sought some food from a house, all he got were sad tears and sighs of the lady of the house. On enquiry the Guru was appalled to hear that there was nothing to eat in that house except for a dry gooseberry, which the lady readily offered to him because she wanted not to turn away a Sanyasi empty handed from her door. Touched by her selflessness Shankar propitiated Goddess Kanakdhara (Laxmi) and opened the doors to fortune for improvised family. So, many avenues of earring opened up suddenly that it seemed that a river of Gold had been diverted to the house. 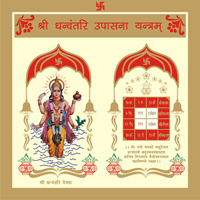 Goddess Kanakdhara is worshipped through this Yantra. The problems like debt, failures in business etc. 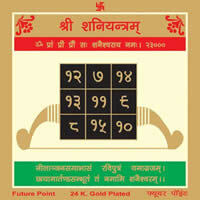 get rectified with the use of this Yantra. 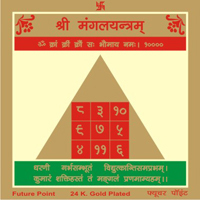 Kanakdhara Siddhi one of the most popular Ashta Siddhies known to ancient Indians is associated with this Yantra only so by worshipping it one acquires unlimited wealth. 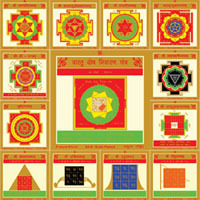 This Yantra has power to attract wealth from more than one resource. This Yantra should be worshipped on Deepawali. Following Mantra should be recited.